"Rover has gone bust," Marie's husband told her. As the car manufacturer completely funded their rather nice lifestyle Marie and Geoff suddenly had to sell up and downsize considerably. "I have a cunning plan," said Marie. "Let's live on a houseboat." Marie, Geoff, the kids and their dog decide to buy an ex hotel boat in need of some serious TLC and set off for Cambridge with absolutely no boating experience and limited enthusiasm. Marie begins her adventure by moaning a lot, very conscious of the comfortable lifestyle she has so suddenly lost. I’m grateful for the voice of reason, her friend Helen who tells her to get a grip and realise what an amazing opportunity she has. I enjoyed the hilarity of the couple learning to steer a boat by taking an inland waterways helmsman’s course with ‘Dave’. Marie sees the funny side of learning to navigate canals and rivers on what she describes as a ‘floating coffin’. I have great respect for any family that attempts to refurbish a boat while living aboard (Zoe at her blog Give an Earthly is having a go at that right now!) The Doctor and I are rarely brave enough to attempt DIY. Marie’s boat is called ‘Happy Go Lucky’ and at the beginning of the story Marie is anything but that. But I loved the way that as the story progresses the couple become more relaxed and dishevelled, the waterways begin to change them, and they find out that sometimes less is more. Although there are several travelogues about narrowboating out there, there are not so many memoirs about family life on board. I wanted to find out about other mothers who had experiences that are similar to mine. How is Marie’s life different to mine? What is it like living on board with older kids? How different is it having a mooring? What’s it like throwing a load of refurbishment work into the mix? I think this memoir is pretty unique. 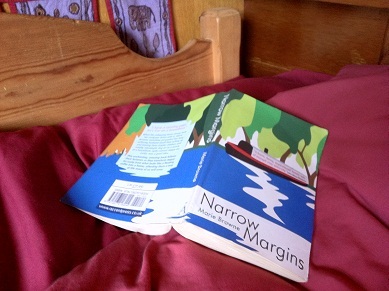 Narrow Margins is available on Amazon right now. Why not grab a copy for yourself of this funny story about a family’s triumph over adversity?